In a nation where 42 percent of children live in low-income families, too many schools face the challenge of teaching students burdened with unmet needs that pose obstacles to learning. If our aim as a country is to ensure that all children succeed academically, particularly those living in struggling communities with limited resources, we simply can’t ask schools to do it alone. Community schools that align schools and community resources are a promising strategy for improving student outcomes by providing wraparound services that meet the social, physical, cognitive, and economic needs of both students and families. And while much of the current literature on community schools focuses on highlighting policies and practices to support the implementation of community school models, very little research examines how community schools affect student outcomes. Since 2007, the John W. Gardner Center for Youth and Their Communities ( JGC) at Stanford University has partnered with the Redwood City School District (RCSD) in Redwood City, Calif., south of San Francisco, to conduct research on participation and outcomes for students in the Redwood City School District’s community schools. This local initiative includes five community schools, with students in grades K through 8, that provided more than 250 programs, services, and events in the 2010-11 school year. The purpose of this paper is to provide an in-depth analysis of one district’s community schools using quantitative data to show how students and families use services at these schools and how those services work together to positively affect student outcomes. Supplemental programs provided at Redwood City School District community schools reached more than 70 percent of the students enrolled at those schools. These programs generally served the most socioeconomically disadvantaged students, including high rates of students who were English learners, were eligible for subsidized meals, and had parents who had not completed high school. English learner students with consistent program participation over time showed gains in English language development scores. In the elementary grades, these gains were tied to family engagement participation, but continued gains during middle school were associated with frequent extended learning program participation. Community school programs were linked to positive attitudes about school for middle school students. Students with family engagement in elementary school entered middle school more likely to say that their school provided a supportive environment compared to those without family engagement. Once in middle school, frequent participation in extended learning programs was linked to increases in students’ perceptions of their school as a supportive environment. Feeling supported at school was linked to students’ motivation and academic confidence, both of which were associated with gains in achievement in math for all students and English language development scores for English learners. Expanding community schools to reach more students. Findings from this analysis show that community schools are a promising strategy for improving student outcomes. In the current climate of budget cuts, it is important for policymakers at the state and federal levels to advocate for community schools as an efficient, effective way to use scarce resources by leveraging partnerships. Districts can further help by creating district-wide community school initiatives. 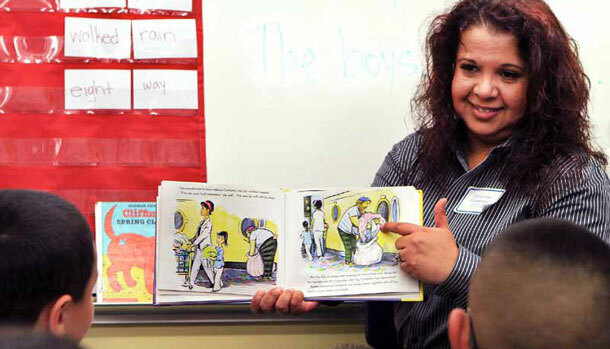 Supporting improved outcomes for English learners at community schools. Academic score gains linked to community school program participation were especially strong for English learners in our analysis and were tied to receiving multiple services. Therefore, it is important for policymakers to promote collaborative structures at community schools in which students and families are more likely to make use of the multiple services available. One method is to streamline the multiple and fractured funding sources that go into community schools to foster collaboration and common goals instead of competition for resources and disparate data collection and reporting. Findings in this analysis show that family engagement plays a key role, and local leaders can encourage family engagement by reaching out to parents and inviting them to be partners in a variety of different opportunities both at school and at home. Fostering positive attitudes about school as a strategy for raising achievement. This analysis shows the critical role of student attitudes toward school and learning as one mechanism through which community schools affect achievement. The practices that foster these attitudes are well established in existing research, so it is important to ensure that all staff that interact with youth at community schools use these practices. Policymakers can adopt school climate standards and invest in measuring progress toward those standards, and local leaders can integrate these practices into existing classroom or program observation rubrics. Building capacity for collecting and using data. Although data collection and analysis on the broad array of services offered at community schools is difficult, it is critical to informing policy and programmatic decision making. This involves sharing data among the many partners that provide services at com- munity schools, and policymakers can make the process easier by clarifying and aligning regulations on data sharing at the federal and state levels. Local community school leaders can further help by developing shared goals and indicators among partners and creating a culture of sharing and examining data together with partners. Researchers are an important resource for community schools to involve in these efforts, and it will be important for the research field to find new strategies to meet the needs of the expanding community schools movement. This report, by focusing on the experience of the Redwood City School District, seeks to inform community school efforts in other parts of the country with insights into potential ways that community schools interact with students and families to improve student outcomes.